From deep inside Muslim territory comes our report from A.A.M.I. Ministers. This region is famous for the struggle for religious autonomy and freedom. 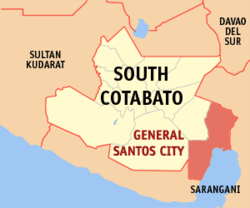 Sadly the news is often about violence from South Cotabato. But God is working here. He will not leave sincere people in darkness. People are hungry for true Christianity. Faith that is living. People who follow the bible and preach from the bible. Our brothers and sisters there provide evidence of a changed lifestyle. 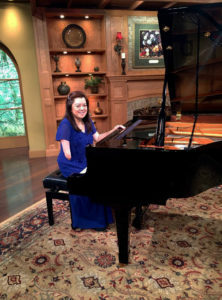 It cultivates the ground for the evangelist work we do. Adopt a Ministers baptisms in the heart of Muslim territory. On May 23 of this year, we baptized 87 precious soulsfor Christ, the fruit of our one month youth training here in my assigned area with a few adopted ministers of Southern Mindanao Mission involved. Our main speaker was Pastor Jerry Patalinghog, South Philippine Union Conference Youth Director. Help us pray that these newly baptized will continue to worship God and will stay steadfast until Jesus’ coming. This time my task is to nurture the newly baptized. Thank you to all the AAMI sponsors for their continued support of this program. 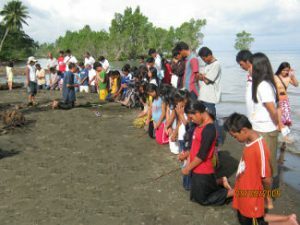 On May 17-30, 2009 we held a crusade in the town of Malapatan, Sarangani province. map shows the Sarangani Province is located.Malapatan Sarangani Province. 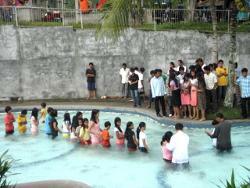 Sixty to seventy people attended and by the grace of God, 35 souls were baptized. One of them was Consorcio Lerio, a hardened criminal. “I killed many people, and one of them is my wife. I chopped her into pieces and then buried her knee level in the ground.” Mr. Lerio said. “How can you kill?” I asked. This time shows after they were baptized and surrendering their hearts to God. “It depends. It could be through the use of a gun or bolo (long knife). And if the victim does not die right away and cries, asking for forgiveness or saying ‘sorry,’ I still killed or finished him anyway,” he answered. And according to Mr. Lerio, he was not put in prison because he was hired to kill by the political people. But after Mr. Lerio listened to the Bible seminar every night, he was touched by the Holy Spirit and he confessed all his sins. He also said, “If I was put in the jail I could pay all my sins.” He was really confessing with tears in his eyes. He thought that there was no hope of salvation for him, but now he found out about what Christ could offer him and he is very happy. Mr. Lerio listened to the message every night; he was given hope when he accepted Jesus Christ as his personal Savior through baptism. And also his children were baptized as well as his brother with his wife. And now they are happy going to church worshiping the Lord. This is how they were going to be baptized. I thank God and our sponsors for their support of God’s work. 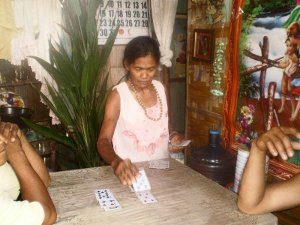 A fortune teller accepted Jesus as her personnal Saviour. A certain woman named Nanay Mila Gamboa who resides in Barangay Buca, Sta Maria Davao Del Sur was one of the 59 precious souls who accepted Jesus Christ through baptism. To be a Seventh day Adventist was far from Nanay Mila’s thoughts. According to her, when her son, Edwin Gamboa, became an SDA, she kept on teasing him and sometimes she tried to stop him from going to church because she wanted her son to retain his old belief as a Catholic. For more than 50 years Nanay Mila worshipped God in various practices of worship. She was a fortune teller; she could predict your future through reading your palm or through cards. According to Nanay Mila, her prediction in the past was usually 80 percent right. Like her previous prediction that a certain movie actress will die, the week after her prediction, it happened. Nanay Mila is so well known as the best fortune teller in her municipality; some well-known people visit her house regularly to know their luck and future. As part of our ministerial work, we visited the area. Going there was not easy because 15 kilometers from Santa Maria Municipal, the path winded to a river bank. But our priority was helping souls, thus, together with two adopted ministers, Pastors: Robert Mirasol and Godofredo Otero and a layman, Brother Maximino Lanojan, went there. There we met Nanay Mila. We tried to convince her to have Bible study. According to Edwin, he found out that his mother keeps on reading the Bible every day and night instead of reading palms and cards. Nanay Mila told Edwin that she will tell their neighbors about the second coming, new heaven and new earth, New Jerusalem, hell, and 7 last plagues. Nanay Mila is no longer a “fortune” teller. Rather, she is now a “future” teller. Thank you all for supporting our work.